This webpage contains information, links and FAQ's about obtaining and using burn permits to burn slash piles in the Black Hills Forest Fire Protection District. A temporary burn permit is needed to burn slash piles or other woody biomass from road clearing projects, building projects, or agricultural crops (i.e. spoiled hay bales) within the Black Hills Forest Fire Protection District. Burn Permits for open burning in the Black Hills Forest Fire Protection District are issued from November 1st thru March 31st each winter. The permits are only valid to use for burning slash piles when there is continuous snow cover, the depth of the snow is at least 2 inches for small slash piles and 6 inches for large slash piles. What is the Black Hills Forest Fire Protection District? The Black Hills Forest Fire Protection District was formed by state law in 1941. It was created in part to protect the timber on areas subject to unusual fire dangers. Early in recorded Black Hills history, the first foresters and firefighters came to realize that the ponderosa pine/grassland ecosystem of the Black Hills could burn any time of the year when there was no significant snow cover. Unlike higher elevation forests in the Rocky Mountain West which hold continuous snow cover in the winter, an open burning season in the lower elevations of the Black Hills would result in many escaped fires on a yearly basis. What area of South Dakota does the Black Hills Forest Fire Protection District cover? The area covered is identified in South Dakota Codified Law SDCL 34-35-15. Generally, this covers the portion that is south and west of Interstate 90 from the Wyoming state line to exit 61, west of Elk Vale Road from exit 61 to its intersection with Highway 79, west of Highway 79/385 from Elk Vale Road to the Cheyenne River, and north of the Cheyenne River from Highway 385 back to the Wyoming state line. Incorporated towns and municipalities within this area are not part of the Black Hills Forest Fire Protection District, except Piedmont. If you want to conduct open burning in those towns or cities, you would need to contact the local city officials. Are incorporated towns and cities part of the Black Hills Forest Fire Protection District? No. 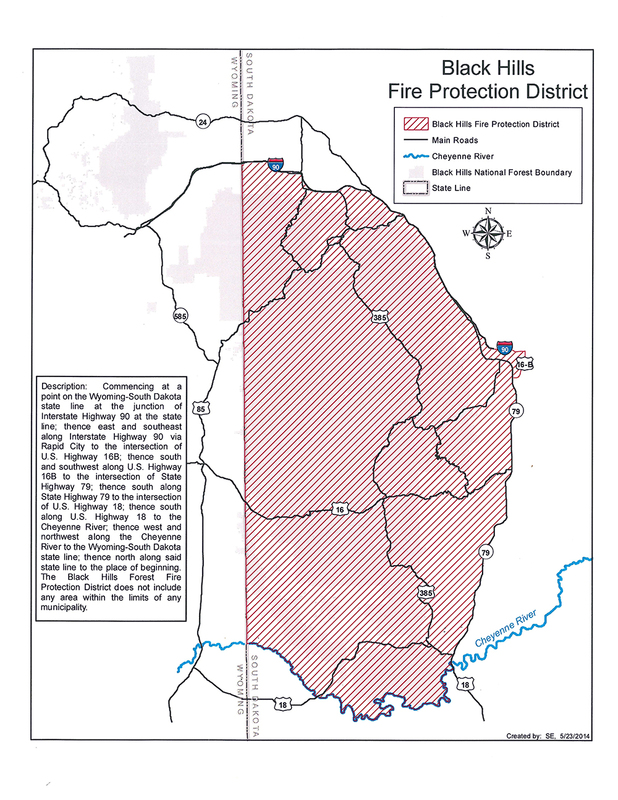 Incorporated towns and municipalities within this area are not part of the Black Hills Forest Fire Protection District. These towns would include: Hot Springs, Pringle, Custer, Hermosa, Hill City, Keystone, Summerset, Sturgis, Whitewood, Spearfish, Deadwood, Central City and Lead. If you want to conduct open burning in those towns or cities, you would need to contact the local city officials. However, the City of Piedmont has enacted a resoultion to include themselves into the Black Hills Forest Fire Protection District and a permit is required. What is the difference between a small slash pile and a large slash pile? When applying for an online permit, you will be given the choice of a small or large slash pile on the permit menu. A small slash pile is a brush pile constructed by hand, usually no larger than 4 to 5 feet in height, and 6 feet in diameter. These handpiles are a very common sight to see in the Black Hills and comprise 95% of the temporary burning permits issued. A large slash pile is a mechanically constructed pile that is associated with a commercial logging sale or land development activity. These piles can only be lit under certain conditions, given that these piles can loft hot firebrands for a half-mile or more and smolder for weeks after lit. It is important for fire prevention purposes that a piece of heavy machinery, such as bulldozer, skid-steer loader or tractor is a available to work these large piles as they burn down. Can I use my campfire permit or burn permit on US Forest Service Land in the Black Hills National Forest? No. A temporary campfire permit or burn permit is only valid for use on private land within the Black Hills Forest Fire Protection District, with permission of the landowner. Campfires on Black Hills National Forest Service lands in South Dakota are only allowed in established campfire grates at designated picnic or campgrounds. Recreational campfires outside of those areas on the Black Hills National Forest in South Dakota need to be permitted by the District Ranger or authorized representative. When I issue myself a permit online, do I need to contact the local dispatch center or Sheriff's office? Yes. Call your local dispatch center on the day of ignition to notify them. The local center dispatchers will be able to view your permit details and the location of your burn once you issue yourself a permit. What do I need to know before issuing myself a permit online? You will need to know what county you will be burning in and the name of the local fire department that serves the area where you are burning. Who can view the information that I am providing online to get a permit? Local dispatchers, law enforcement and fire officials will be able to view the relevant information (first/last name, data of permit, type of permit, physical location of permitted burn and username). Personal information such as phone number, mailing address and email address can only be viewed by the system administrator. Can I go on-line to get a permit for a burn barrel or permanent fixed campfire place? No. These permits require a field inspection and must be sited and constructed to certain standards. Please contact the Wildland FireDivision Field Office staff to obtain those permits. What are the requirements for an outdoor fire place? Here is a description of outdoor fire place regulations and a diagram. What are the requirements for a burn barrel? Here is a description of burn barrel regulations and a diagram. Can I go on-line to get a permit for a broadcast burn? No. A broadcast burn is defined as fire that is allowed to burn freely through the grass, underbrush and timber; this is generally known as a 'controlled burn'. Broadcast burns require a written burn plan to be on file and approved by the Secretary of Agriculture before conducting such burns on private land in the Black Hills Forest Fire Protection District. Do I need to get more than one permit per burning season? It depends on the location of the burn. If the burn location changes then you need a new permit. If the burn season changes then you need a new permit. All permits expire on March 31. If you are burning in the same location within the same burn season then one permit will be sufficient for the entire burn season. Who Decides when Burn Permits are available and burning is allowed? South Dakota Wildland Fire Division will determine when safe burn conditions exist. This information is available on our website . What is a chinook wind and why can it be dangerous? Chinook winds are warm down-slope winds that occur anytime of the year, but especially in the winter. They occur on the lee or east side of the Black Hills and Rocky Mountains. They will be so warm as to melt snow in the middle of the night, and bring what once was thought as a cold slash pile, back to life, fanning it into a forest fire. Make sure your fire is out! Are you located in the Black Hills Forest Fire Protection District? Please contact one of our field offices if you have any questions about the location of your proposed camp fire in the Black Hills Forest Fire Protection District. Is my permit good for burning on U.S. Forest Service Lands in the Black Hills National Forest? No. You will need to contact the local Black Hills District Ranger's Office for permission to use open fire on the Black Hills National Forest.